Nashville coach Barry Trotz believes if Nicklas Lidstrom were to ever retire -- and that doesn't appear to be imminent considering the Wings' captain still doesn't look like a mere mortal on most nights -- Predators defenseman Shea Weber would take his place as an annual Norris Trophy finalist. "He plays a physical game and a skill game," Trotz told NHL.com of Weber, the Predators' lone All-Star. "There are so many good things about Shea. It's hard to imagine anyone having a bigger impact for their team this season than Shea has had for us." Reminded about Lidstrom's value to the Wings, Trotz said, "With Nick not even in the lineup, they still have a pretty good team." Trotz believes opposing coaches are paying the ultimate compliment to Weber this season by game-planning against him. Weber is learning how to fight through that. He has 29 points this season, but only 7 in the last 17 games. "There are a lot of good coaches and scouts in this League and he doesn't get a lot of room," Trotz said. "If the puck is coming his way there is someone standing on top of him. He has learned to deal with that and still be effective with the added attention he's getting. He's still very much a contributing guy. "He really is a true pro," the coach added. "He's got a lot of self discipline, self-analysis and he's really grounded. He really has become one of the leaders of our hockey team. There is no question he's one of the leaders of our defense." Now isn't the time for Columbus Blue Jackets captain Rick Nash to be missing games, but all he can do is listen to the team doctors, who sent the All-Star forward upstairs for press box duty this weekend. During a conference call Wednesday, Nash listed himself as day-to-day with a lower-body injury he suffered in Detroit on Tuesday night when he fell awkwardly into the Joe Louis Arena boards early in the first period. He didn't return to the game and also missed Friday's game in Washington. Nash is supposed to miss Saturday's game against Minnesota at Nationwide Arena, but is hopeful he'll be cleared to return for Tuesday when the Jackets host Colorado. "(Thursday) was a good day. I'm feeling good," Nash said. "It's just one of those things where you don't want to come back for one game and then miss another week. So, we're just going to take it a little slow and hopefully after the weekend, early next week, I'll be back at it." The Jackets, the only NHL team to have never made the playoffs, entered Friday's game three points out of a playoff spot in the Western Conference, but with Edmonton and Colorado still in their way of catching the eighth-place Wild. Even though it's only Jan. 10, Nash said Columbus is already in "a do-or-die situation." But, he added, "I'm not going to go against the doctor's judgment. They're professionals. Once they say I'm good to go, I'll go." For the Jackets' sake, hopefully Nash, their leading scorer with 17 goals and 22 assists, misses only the two games. After Friday, the Jackets have six more games before All-Star Weekend and those, Nash said, are especially critical. "We've got a chance to win every single night," he said. "That's all you can ask from a team. We know we have it now." The Blue Jackets have it in large part to the surprising success of goalie Steve Mason, who entered Friday's game leading the NHL with a .934 save percentage and 1.82 goals-against average. Since making his NHL debut on Nov. 5, Mason is 13-9-1. "One thing I notice with him is he's unbelievable at playing the puck," Nash said. "He's actually a big guy and he's really good. I think that helps out a lot with the defensemen. Just knowing that he's so solid back there, he's so confident in his game, he's so calm, it makes everyone around him play the same way." The Jackets need Nash to be a part of that group. Preds standing pat -- Nashville Predators General Manager David Poile told NHL.com Wednesday that he was battling a bad cold while his team was mired in one of the worst slumps in franchise history. Hopefully Poile is feeling better today now that the Predators struck for five goals in a win against the slumping Pittsburgh Penguins Thursday night. Thursday's game notwithstanding, the Predators' six-game losing streak prior to facing the Penguins at the Sommet Center dropped them out of the playoff race in the Western Conference. The Predators are 4-9-1 in their last 14 games. They entered Friday only four points out of a playoff spot, but in 14th place. Even so, Poile said he's not piling up expensive phone bills, frantically trying to make a trade to get his struggling team straightened out. "I think I'm doing my job as a manager by staying in touch with a lot of teams, but we have a lot of things going good with us," Poile told NHL.com. "It boils down to everything on the defensive side of the puck; our goals against, the penalty kill and our goaltending." On the flip side, the Predators are hoping their five-goal outburst Thursday is a sign of things to come offensively. They had scored only 21 goals in their previous 13 games. Poile said it was the worst drought he's experienced in all of his years in the NHL. He said Wednesday the Predators' drought is just a confidence thing and is hoping the return of former 30-goal scorer Steve Sullivan from a 22-month absence due to lower-back problems will be part of the solution. Kane returns -- He played in the Bridgestone NHL Winter Classic on New Year's Day because that's an event Patrick Kane simply couldn't miss. The super sophomore sat out the next two games, nursing a right ankle injury that limited him at Wrigley Field. Kane returned Thursday in the Hawks' disappointing 2-1 loss at Colorado. He assisted on Brian Campbell's game-tying goal 5:16 into the second period, but his words after the game suggest he was playing despite the injury, which he did on Jan. 1 as well. "Sometimes I'll skate down and feel it a little bit, but that's to be expected," Kane told the Chicago Sun-Times. "If I just worry about playing the game and not worry about the injury, things will be OK."
The Hawks didn't act as if they sorely missed their biggest offensive weapon. Nine players combined to score 11 goals in the two games Kane missed. Hawks forward Adam Burish, a fourth-liner who scored his first goal of the season against Phoenix, credited coach Joel Quenneville for having the confidence to roll four lines. 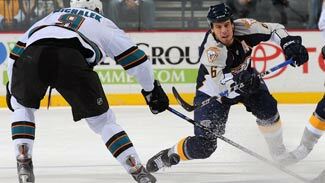 "You can throw anybody out there and they're going to have the ability to score," Burish told the Chicago Tribune. "That's part of the reason down the stretch and into the playoff push teams are going to have a tough time matching up." More All-Stars -- The Central Division will have eight representatives at the NHL All-Star Game in Montreal on Jan. 25 and another eight farmhands were selected to play in the AHL All-Star Classic the following night in Worcester, Mass. Forward Nikita Filatov (Columbus) and defenseman Jakub Kindl (Detroit) were selected as starters for the PlanetUSA All-Star team, which is comprised of 24 AHL players who were not born in Canada. Since Filatov was recalled by the Blue Jackets this week, his status for the AHL All-Star Classic is in doubt, according to a team official. Derick Brassard had to miss last year's AHL All-Star Classic because he was playing with the Jackets at the time. Forward Petri Kontiola (Chicago), defenseman Jonas Junland (St. Louis) and goalie Daniel Larsson (Detroit) were also chosen to play for PlanetUSA. Nashville farmhands Cal O'Reilly, Mike Santorelli and Cody Franson were chosen to play for the Canadian squad. Santorelli made his NHL debut Thursday night, so like Filatov, his status for the All-Star Classic on Jan. 26 is in doubt. Don't look now -- Think the San Jose Sharks are beginning to look over their shoulders? How could they not be with the Detroit Red Wings surging toward the top of the Western Conference, a place they lived for the entire 2007-08 season. San Jose's once double-digit lead in the conference had dwindled to just two points before its game in Edmonton on Friday because the Wings are riding a five- game winning streak in which they have outscored the opposition by a combined 22-7. Detroit beat the Blackhawks twice, Minnesota in a shootout, Columbus in a shutout and it suffocated the Dallas Stars on Thursday night as six players scored in a 6-1 win. "Ozzie has come back and is real fresh for us. That is a real good sign." Goalie Chris Osgood, who has been bothered by a groin problem for most of the season, is starting to sizzle. He has stopped 55 of the last 58 shots he's faced to gain wins against Minnesota and Dallas. "Ozzie has come back and is real fresh for us," Wings coach Mike Babcock told the Detroit Free-Press. "That is a real good sign." Pavel Datsyuk has piled up 22 points in the last 12 games. Marian Hossa has 6 points in the last four games after being shut out for three straight games. Henrik Zetterberg has seven points in the last four games after being blanked in two straight. This and that -- Raffi Torres could return to the Blue Jackets sometime next week. He returned to the ice Tuesday at the Jackets' morning skate in Detroit and reported no pain in his surgically repaired knee to the Columbus Dispatch. … St. Louis center Andy McDonald has also been practicing and his return from a broken leg could be imminent. He is with the team on its current road trip. … Jackets winger Kristian Huselius could play tonight after suffering a concussion last Saturday in St. Louis. … Detroit has killed 23 straight penalties at Joe Louis Arena. He said it -- "When he plays it looks like he has joy in his game," Nashville coach Barry Trotz told NHL.com about Steve Sullivan, who is expected to return tonight. "He doesn't look to have that great burst yet, but if he's moving he's got the speed. That explosiveness is not where it was when he left, but it's better than 80 percent of the guys in the League."